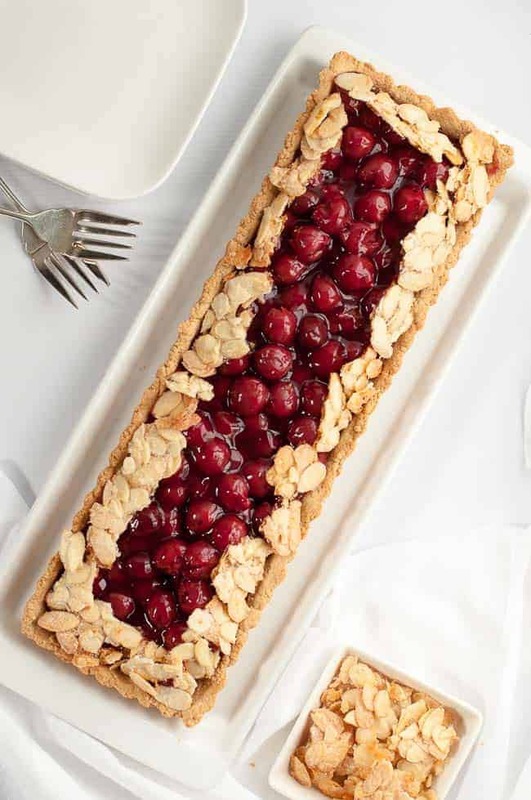 It’s gluten-free, it’s just sweet enough, and this sour cherry almond tart is an easy dessert to make for your next get-together! 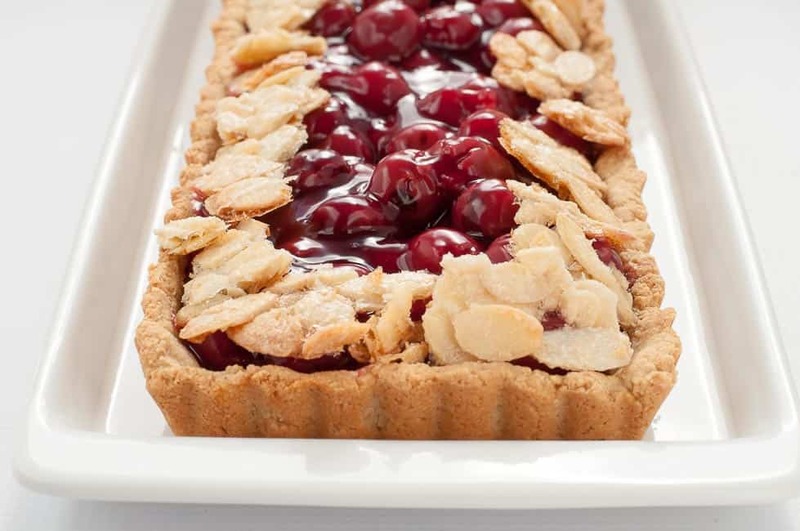 I made this gluten-free sour cherry almond tart recently, simply because I had picked up a jar of sour cherries on a whim. 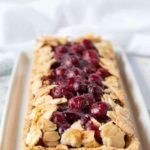 They’re not an ingredient I use often, but I was thinking ahead to creating colourful Christmas desserts and those richly coloured cherries caught my eye. 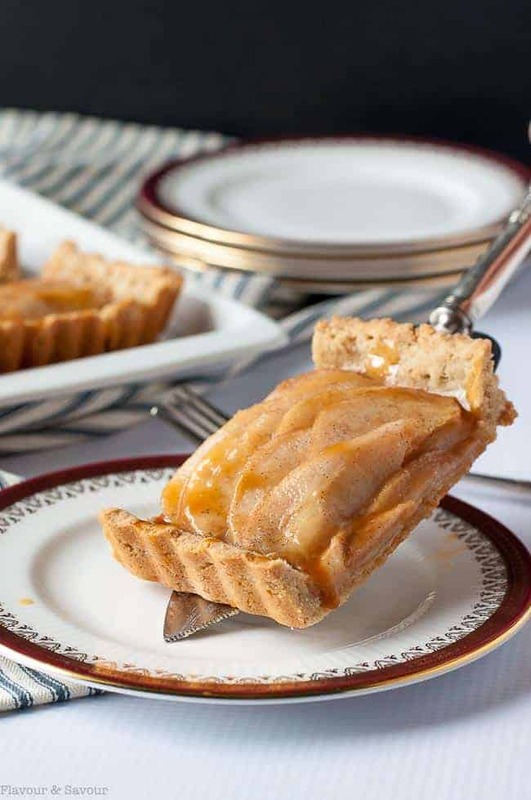 It was fun to experiment with them and create this tart–three times! 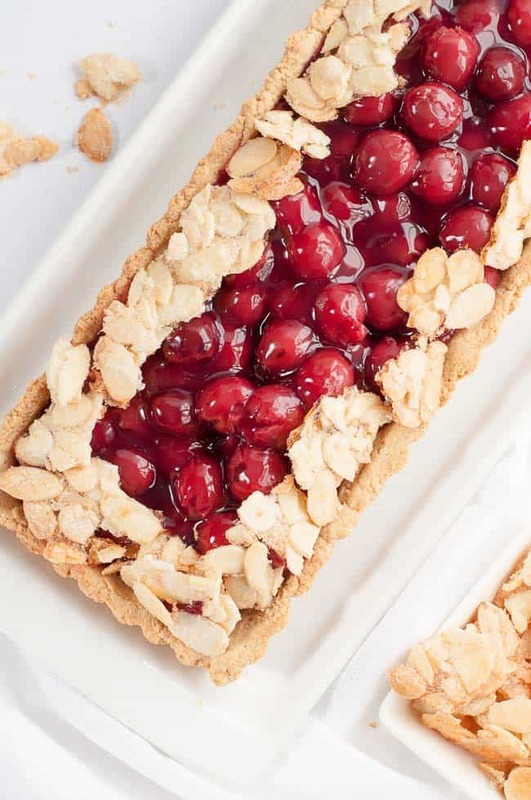 This gluten-free Sour Cherry Almond Tart needs only three simple steps. Make the crust and bake it. It’s a delicious mix of almond flour and oat flour. 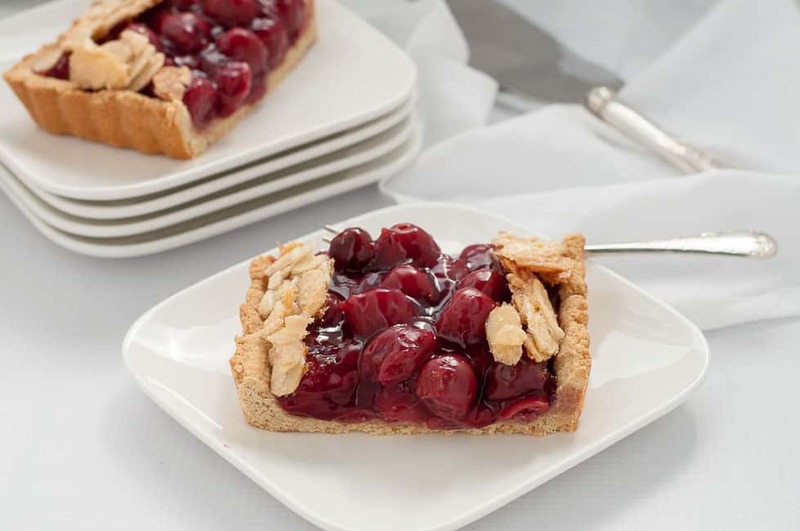 Make the filling by heating the cherry juice with cornstarch until thickened, then adding it to the cherries. 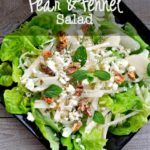 Make the crunchy topping by toasting almonds with a little egg white and sugar in the oven. I used a jar of pitted sour cherries in a light syrup, so I didn’t add any extra sugar to the filling. Denis and I don’t like desserts that are overly sweet, so this tart was just right for us. The crust has a subtle sweetness and the flaked almonds are sweet, so leaving the filling slightly tart was the perfect contrast. If you prefer your dessert to be sweeter, you can add one or two tablespoons of sugar to the cherry juice while you heat it. But it certainly isn’t necessary. Then simply assemble, slice and serve! This tart is delicious as is. No ice cream or whipped cream necessary! 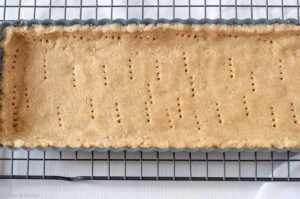 As with all gluten-free desserts, be sure to line the bottom of your baking pan with parchment paper for easy removal. I used an 13 x 4 inch oblong pan with a removable bottom, but a 9-inch round pan will work, too. 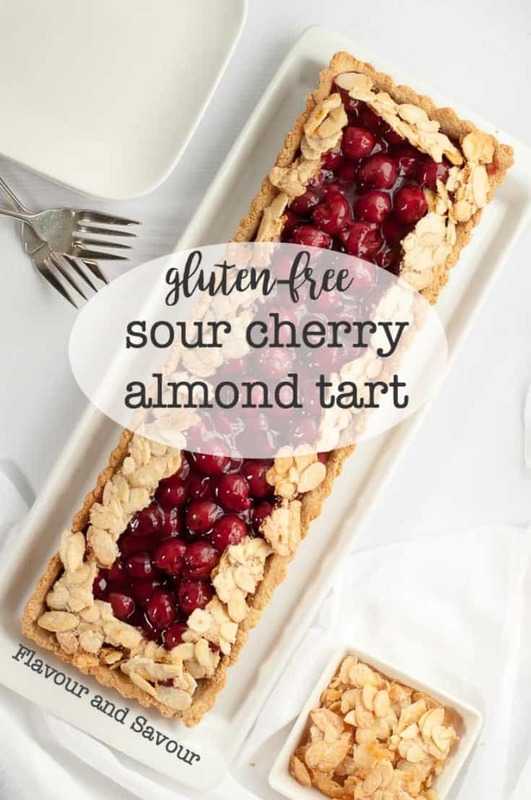 This Sour Cherry Almond Tart is gluten-free, it's just sweet enough, and it's an easy dessert to make for your next party! 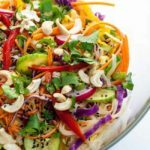 Use a round 9-inch or oblong pan with a removable bottom. Combine superfine almond flour and oat flour and stir in melted butter (or coconut oil) and maple syrup until well blended. Transfer to tart pan. Transfer to oven and bake for 16 - 18 minutes or until golden. Edges will begin to brown slightly. Remove. Cool. Drain the cherries, saving the juice and put the cherries in a medium bowl. Measure 1/4 cup juice and whisk it with the cornstarch in a small saucepan. Add the remaining 1 cup cherry juice. Bring to a boil and cook for about 30 seconds after it boils, whisking constantly until mixture is thick and glossy. Remove from heat and add the almond extract. Add the mixture to the cherries and gently fold until combined. Fill the baked tart shell. Combine the sliced almonds with the sugar and 1 tbsp egg white, (not the whole egg white). 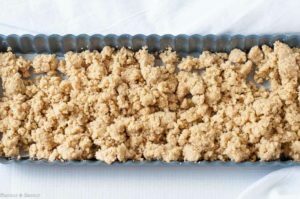 Line a baking sheet with parchment paper and spread mixture out in a single layer. Bake, stirring half way through, for about 10 minutes or until almonds are lightly browned. Let cool, then break into small pieces. Arrange around the edge of the tart. Serve! I used a jar of sour cherries in light syrup. This dessert was definitely sweet enough for me. If you prefer your dessert to be sweeter, you can add one or two tablespoons of sugar to the cherry juice while you heat it. 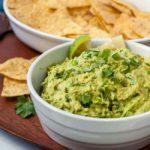 You can easily make your own oat flour by grinding rolled oats in a high-speed blender. Remember to measure the oat flour after grinding, not before. What a beautiful tart! You might know that I have a “mild obsession” for tarts (and scones 😉 ) . 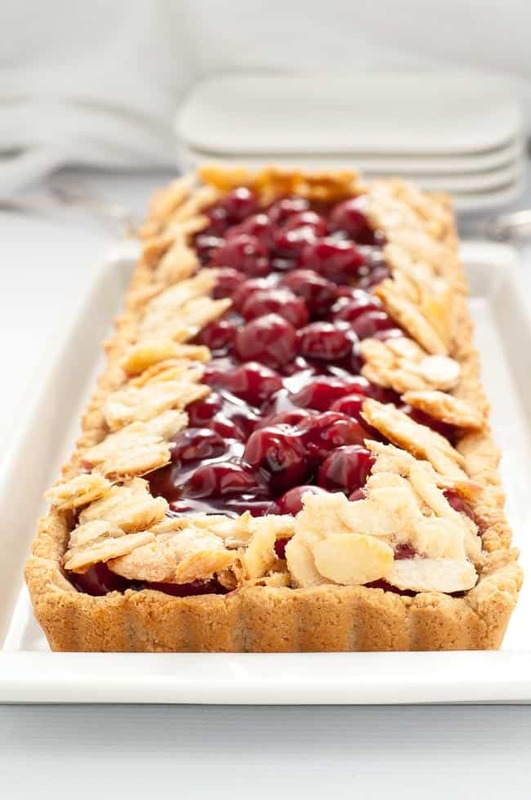 This one made with almond and oat flour looks beautiful! We have so many sour cherries in the freezer, plus we made sour cherry jam, sour cherries in syrup and in brandy. Needless to say, we love them 😉 . Perfect counterpart to a delicious, sweet tart. Maybe it was because I’ve been reading your beautiful blog for so long that I picked up that jar of cherries on a whim! if so, thanks for the inspiration! Thanks! This is a crust recipe I’ll use over and over. It was so easy, and it turns out beautifully every time. And yes, a little dollop of whipped coconut cream is always welcome . . .
I’m sure home-canned sour cherries would be even better! Any suggestions on using fresh sour cherries as there will be no liquid? That’s a great question, especially now during cherry season! 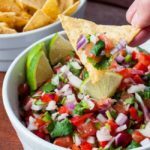 I haven’t tried this recipe with fresh cherries, but this is what I would suggest: I think you would have to increase the amount of fresh cherries. Start by whisking 1/2 cup sugar (or more, depending on how sweet you want your dessert to be) with 1/4 cup cornstarch and 1 tablespoon lemon juice and 1/4 to 1/2 tsp almond extract. Add 4 cups of fresh cherries, bring to a boil, then lower the heat and continue to cook until the mixture is thick. Then transfer to the baked crust, add the almond topping and cool. As I mentioned, I haven’t tried it with fresh cherries, but it should work. Let me know! Thanks for your question.